The Stars and Swag baseball shorts are the perfect short to show your pride for the USA. Vibrant colors that have the American Flag displayed throughout with a very cool design that incorporates the great game of baseball into the short. Perfect baseball shorts for youth baseball die-hard baseball fans. Show em’ off for Independence Day Parades, Memorial Day Cookouts, Flag Day, or any time. Made in Maryland, USA. The Stars and Swag baseball shorts are designed with a side seam, slit pockets and have an inseam of approx. 9 inches. The Stars and Swag baseball shorts also have an elastic waistband and drawstring for a great comfortable fit. 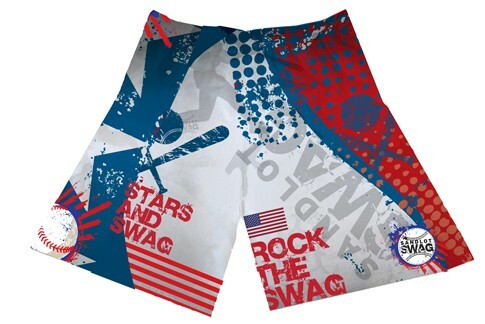 The Stars and Swag baseball shorts features the Sandlot Swag brand located on the front of the shorts as well as the USA flag and the Red, White and Blue colors throughout the short. All our baseball shorts are made using a sublimation process in which the designs are dyed directly into the fabric. The Stars and Swag baseball shorts design won’t fade or wear off and are made of a polyester fabric, so they will not shrink. 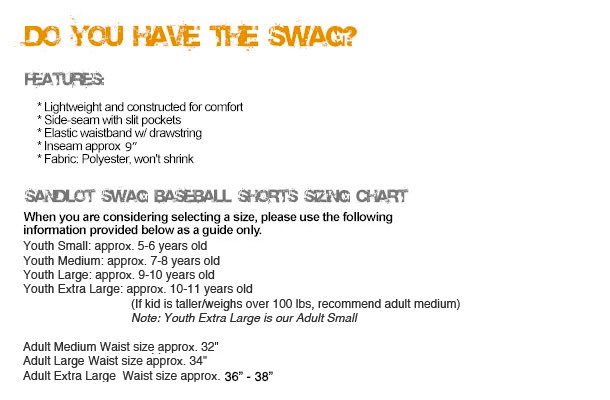 Sizes available for The Stars and Swag baseball shorts are youth small, youth medium, youth large, youth extra large, and adult baseball shorts sizes are medium, large, and extra large.